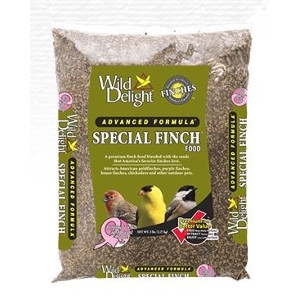 Bring more of America’s favorite wild bird to your back yard with Wild Delight Special Finch Bird Food. This premium blend features Nyjer® seed and fine sunflower chips, which are irresistible to all finches and other small songbirds. This food is great year-round but is especially good for late fall and early winter as the high calorie and fat content of Nyjer® helps birds build their fat reserves in preparation for the cold winter months ahead. Like all Wild Delight bird seeds, Special Finch Bird Food is fortified with the essential vitamins and minerals that wild birds need. It’s also free of chemical preservatives so you can feel good about offering it to the wildlife visiting your yard.